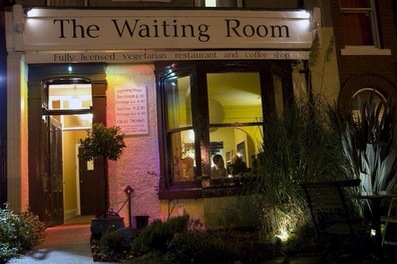 So tonight I went for dinner at a lovely restaurant near my house called ‘The Waiting Room’ in Eaglescliffe. It vegetarian, but don’t let that put you off; it’s been voted one of the best restaurants in the UK (and that’s including the ones that have meat!) and I’ve been going regularly for years. It’s name (I assume) comes from the fact its over the road from Eaglescliffe train station. Either that or people just enjoy loitering in there without buying any food, but that wouldn’t be a particularly good business model so I’m going with the former. One of the reasons I bought a house close by was so I can easily hop on a direct train back to AFormerLondonGirl HQ to visit the parental unit and then hop back up quickly enough when I need my space again. Helen had the spinach and feta pancake, Katie the lasagne with sesame potatoes (yum!) and i had the goats cheese roulade (double yum!). I (as per usual) was the only one with room for dessert so had the usual.. They also have cool events on a Sunday night called ‘Waiting for Sunday’ and they have anything from bands, to comedians and it’s usually quite eclectic which I love. 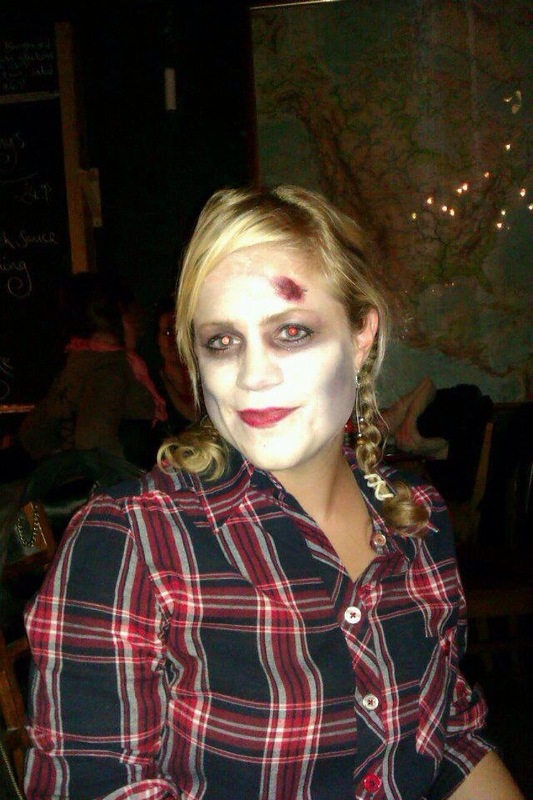 One year I saw a brilliant band called The LoveSick Cowboys and because it was Halloween me and my friend went along as zombie cowgirls. If you are ever in the Teesside area for any reason, you must visit this restaurant, you won’t regret it. So, to follow on from my tipping dilemma as discussed in my previous blog, I mentioned this to my friends Katie and Helen at dinner and asked for their opinions on the matter. ‘Of course, it’s the same as hairdressers isn’t it…except the hair is erm, elsewhere!’. ‘Well no one tips me to to my job!’ (Katie is an accountant). So there we have it folks. I know for a FACT that my window cleaners avoided me last month so I would have to see them to give them a tip this month. The truth is, they are so suspicious looking, I continue to pay them (even though I’m not even sure they are fully cleaning my windows) just to prevent them from potentially burgling my house when I’m at work. Yes that’s right, I’m paying my window cleaners protection money. So we had a wonderful evening, we laughed a lot, ate loads of lovely food and have agreed to head out together over Christmas to have a few drinks, have a dance and attempt to meet some eligible batchelors. Due to my ongoing social awkwardness this is highly unlikely…but one can but try! I’m off to bed as I’m tired after that epic dessert!